I started this little space on the internet when I was a sophomore in college. All the way back then it was called Lavender’s Blue, because my favorite color is purple, and I thought that was cool. I had a purple background in everything. Technically I’ve had this space for five years, but you wouldn’t know that for crap. I don’t sponsor, I don’t accept sponsors, and I can’t get my life together enough to show up here consistently each week. Even though I don’t always implement the things I have learned, I have learned so much from being a part of this amazing community. People are so kind, and so quick to give of their talents and knowledge. Every day it seems that I learn something new from the kind people that I talk to and interact with in this internet world. I thought that today would be a fun time to join in on Helene and Taylor's link up and maybe blog a single day in October. 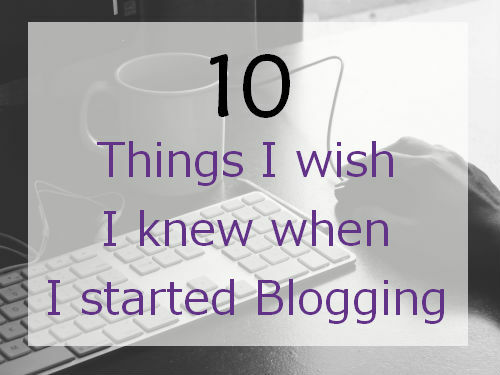 Here is my list of 10 things I wish I knew when I started blogging. 1. It takes a lot more time than you would think it does. Hey you-- 20 year old Alex. I know it sounds fun to have a little online diary that 5 people a day read. But it's going to turn into something that takes way more than the 20 minutes a day that you devote to it now. 2. Stop comparing yourself to others. Yeah those big blogs are super pretty and have tons of readers. But every person started off as small as you. 3. Photos matter. Stop writing posts without them. And stop taking photos that are out of focus and super grainy. Even if they just come from your phone and you just clean them up with Picmonkey, that's okay! Related: Big photos are better. 4. Write about what you want to write about. Don't make up stupid posts that you don't care about, just because you think people are going to want to read them. Stay true to yourself. 5. Don't be afraid to comment on other blogs--people are nice! Make sure you have something of worth to say, but then comment away! 6. If you have writer's block, scan the popular page of Bloglovin. There are always a ton of topics to write about there. Stuff that people think is interesting, and you might never have thought to write about it. 7. Link to your social media accounts. There is some debate about whether or not you should be linking to personal accounts or to dedicated blog accounts. Personally I wouldn't be able to keep up with separate ones, so I think that my personal one is fine. This is a lifestyle blog, so obviously the people on here are reading about my life. Social media is just another great and fun way to connect. 8. Don't stress about posting. This is something that I do because Ilove it. For me this is a creative outlet where I can let off some steam from a stressful job. If I am stressing about getting posts up, then this is becoming a not fun place to be. I know many other bloggers approach this as their job (because it is, and I respect them so much because that is freaking amazing! ), but for you, little Alex, it is not. If you can only get one or two posts up a week because work is a crazy jungle... you are doing good my friend. You are winning at life. 9. Try new things! Take risks! If you want to try adding your own Pinterest button, go for it! What do you have to lose? Just make sure that your site still looks pretty in the end! 10. Keep going! This is going to bring you lots of new friends and opportunities! When you are feeling so down sometimes, working on this space and writing will be such an outlet for you. So just keep at it. I know it is hard sometimes but do it!